Will Keven Mealamu and his All Black teammates dominate again in 2015? If you’re Argentina, Namibia, Georgia or Tonga if you’ve been wondering for years now what it will take to topple the mighty All Blacks. With a Rugby World Cup historical winning percentage of 86% and the title of reigning world champs as well as berth as number one in the world for who can even remember how long now, the All Blacks are in a class of their own. Argentina has pushed them farther than any other team in this pool but Tonga want a real shot a shocking New Zealand and the world if they can just keep their heads about them and play a perfect game. Tonga, Georgia and Namibia will all have to be spot on in the tournament if they are going to wrestle away the second seat to the quarterfinal rounds from Argentina, a side that has shown the power and pace to keep them in the top tier nations along with the other big boys of rugby. Georgia’s lack of resources and ill-discipline have kept them from really progressing on the international stage. This is a relatively young side which means they also lack the depth and experience to draw from when playing top sides like Argentina and New Zealand. At the very best, they may steal one from Tonga or Namibia but they’ll be lucky to crack the try line against superior defensive teams in the Pumas and All Blacks. This is yet another world cup for the All Blacks to lose. They have shown time and time again since the last world cup that they are the team to beat. The mixture of young, raw talent in the backs and the steady, veteran presence in the forward pack means that other teams will have to pray that New Zealand makes mistakes if there to have any chance of derailing the All Blacks championship train. New Zealand is by far the most experienced side with an average of 47 test matches per player and a combined team total of 1,464 international matches. Namibia woefully inexperienced with an average of just 16 international test matches per player and a combined total of 510 international matches for the team. New Zealand captain Richie McCaw has played in a whopping 142 matches since he began his international career in 2001. Compare that to McCaw’s teammate Waisake Naholo who has only played one (1) test match in his fledgling career. Namibia’s Damian Stevens & Wian Conradie also have just one match apiece before walking out onto the biggest stage in rugby. Remember when I said Georgia suffers from ill-discipline? How about 48 yellow cards and 3 red cards worth? Viktor Kolelishvili is the biggest culprit with a haul of five yellow cards and two red cards in seven years of international rugby. How is this guy still playing? 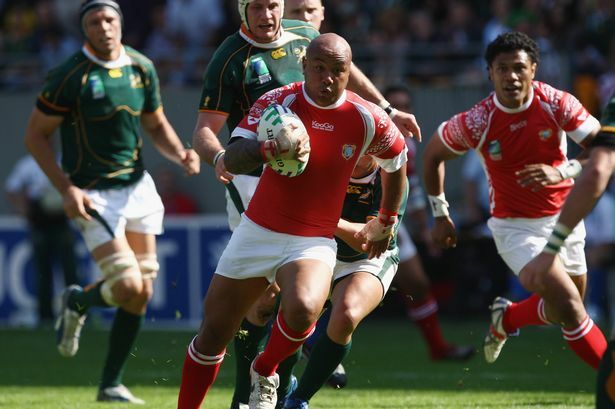 Can Tonga and Nili Latu battle their way into a quarterfinals berth? Daniel Carter (NZ) has also scored the most points in Pool C with a personal tally of 1,516 since he started his international career in 2003. Georgia and Namibia are the youngest sides with an average player age of 26 years. Tonga, like their island cousins Samoa, has the oldest side with an average player age of 29 years. Vasil Lobzhanidze (Georgia) is the youngest player in Pool C at the tender age of 18 years. Georgia’s Vazha Khutsishvili is the shortest guy in the pool measuring in at the miniscule rugby height of 5’4″. There’s plenty of tall timber in Pool C with guys like Joseph Tuineau (Tonga), Brodie Retallick (NZ), and Mariano Galarza all standing tall at 6’7″. Namibia’s AJ De Klerk and Tonga’s Paula Ngauamo are the heaviest in Pool C weighing in at 282 lbs apiece.